American Guitar, Gibson Custom Shop, Nashville, 2010, Model SG, serial number CS8624, expressly for the Pinkburst Project, with Pinkburst Project TKL custom case. 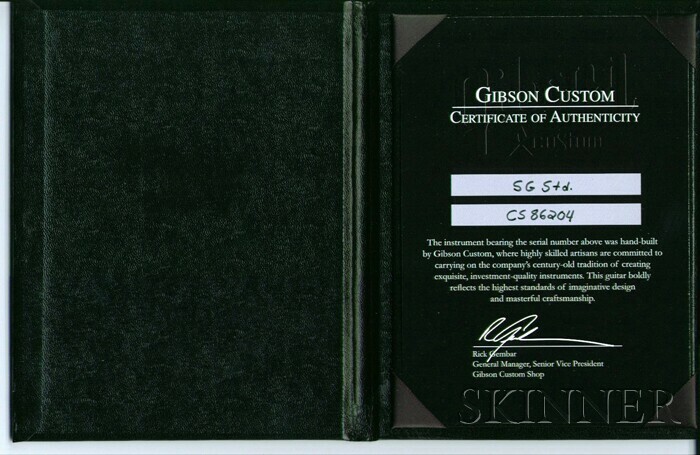 "The sixth and seventh guitars were all ordered together at the NY Gibson showroom. It rapidly became apparent that this collection was really happening so I contacted Gibson rep Lou Vito. He contacted the custom shop. When the guitars arrived in NY six months later, it appeared that the custom shop decided to not only &apos;burst&apos; the front of the guitars, but the backs as well. This put a very unique spin on an already amazing project."